Beyonce and her Destiny’s Child band mates Kelly Rowland and Michelle Williams jump for joy after their 2013 Super Bowl performance on Sunday (February 3) in New Orleans, La. After the amazing performance, the 31-year-old songstress wrote a note celebrating African American women, highlighting the ladies that performed that evening. 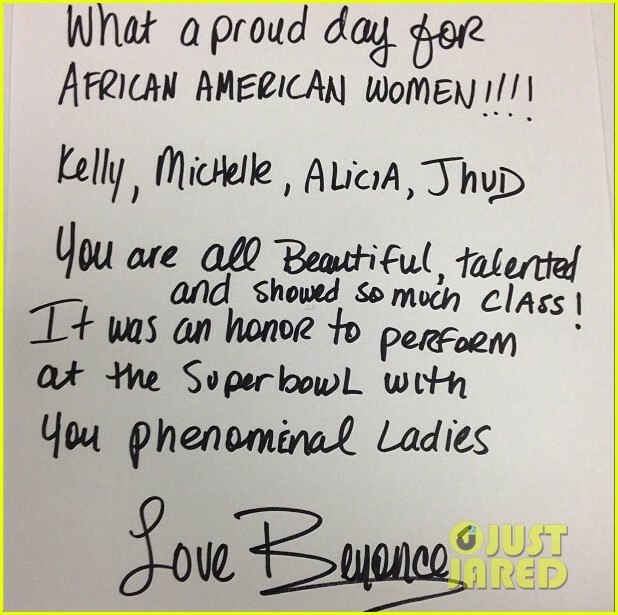 “Beautiful note from @beyonce!! Big Love 2 @KELLYROWLAND & @realmichelleW 1 of my Favorite parts of the show!!! Still on 10!! #SB47 ;-)” Alicia tweeted about the note.